I am a bit behind on my blogging! I finished MAPLE LEAF the Fourth on Sunday, June 27, in time to turn it in for the final round of Quidditch! I haven’t missed posting a finished MAPLE LEAF the Third, by the way. I am still not finished weaving in the ends. Soon. I hope. The lesson of MAPLE LEAF the Fourth is that I shouldn’t make things more complicated than they need to be. In my blog post on MAPLE LEAF the Second, I included the extensive modifications I used in order to avoid weaving in ends. When I knit MAPLE LEAF the Third, which is now complete except for weaving in the ends, I decided to knit the pattern exactly as written. Though it was the third time I was making the pattern, it was the first time I was making it without any modifications. I really did not like knitting it with all the ends hanging loose, but I did learn one thing — I could modify the pattern in a slightly different way and still avoid the majority of end weaving. So this is what I did with MAPLE LEAF the Fourth. MAPLE LEAF the Second required so much modification so that I could slip stitch crochet rather than cut the working yarn. I did not like the heaviness of the edge where I did the slip stitch crochet and felt that the tips of the leaves were not as pointy as I would like. In knitting MAPLE LEAF the Third, I realized that I had also made the assumption that the yarn always had to be reconnected to the right side of the work. This is an incorrect assumption. It is just as easy to connect the working yarn back on the wrong side and purl across. This should have been obvious to me before, but it had not connected in my brain until I knit MAPLE LEAF the Third according to the pattern directions. Once I realized this, I decided that I would take a hybrid approach with MAPLE LEAF the Fourth. I would knit the pattern as written, but with the small points within a corner I would slip-stitch crochet rather than cutting the yarn. I would only cut the yarn after completing each corner, which means at the end of the 5 longest points in the picture of the shawl. This should leave me with 12 ends to weave in: one at the end of each point where I cut the yarn, one where I rejoined the yarn for each place where I rejoined the yarn (that’s only 4 places, not 5 since the first corner is started with the working yarn from the main section of the shawl), two for joining the second skein of yarn since this shawl takes two, and one for the cast on edge. I ended up with 14 ends on MAPLE LEAF the Fourth because the second skein I attached was a partial and did not have quite enough yarn to finish the shawl off and I had to add a third skein. This is a major improvement over the 50+ ends you have if you knit the pattern as written and it reduced the extent of heavy edge created by the slip-stitch crochet and gave me the pointy tips I wanted. And it is much less complicated than jumping all over the pattern like I was before. We have a winner!!! This is the approach I will take to knitting the rest of these shawls. I only have nine more to go! 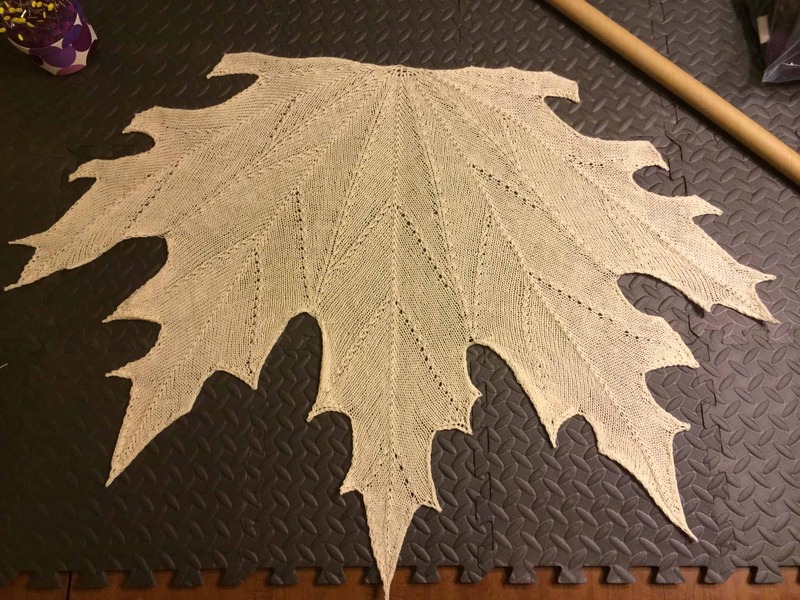 I finished knitting MAPLE LEAF the Fourth around midnight on June 27. I had until 3:00 am on June 28 to turn it in for Quidditch. Shawls are not considered complete for HPKCHC until they are blocked, so I had to pin it out for blocking. Since my husband was going to bed so he would be awake at work on Monday morning, I had to block on my dining room table rather than in the bedroom. A blocking picture is an acceptable turn in picture for HPKCHC, so I could have gone to bed after pinning it out, but that meant leaving the shawl accessible to the cats, which is not generally a good idea. Best case scenario, they would sleep on it. Worst case, they would use the blocking mats to sharpen their claws. They really like those mats for that purpose, so it is highly probably that sharpening would happen while I was busy sleeping. So I got out the big guns: the most powerful fan in the house. 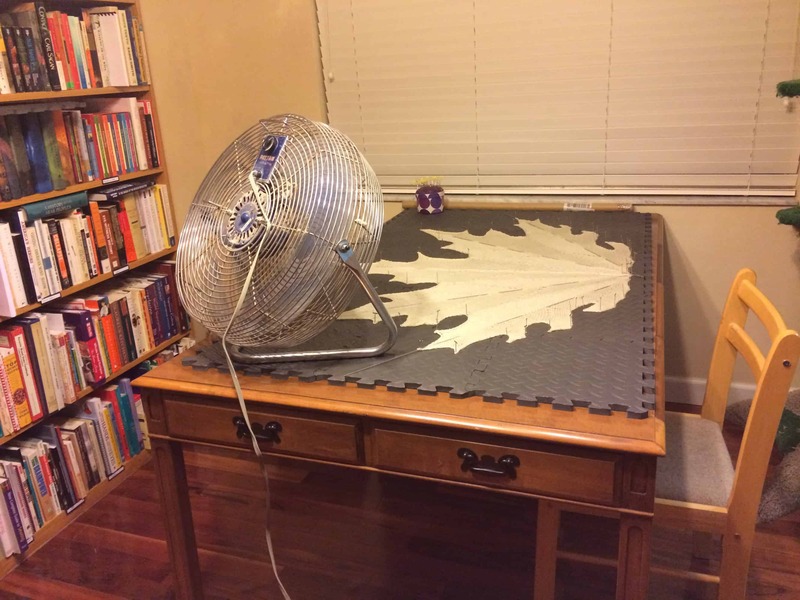 I frequently use a fan to speed up drying for a blocking project. I usually block on my bed since it is the only space in the house big enough that is not accessible to the cats. That means whatever I am blocking must be dry by the time we go to bed. Most projects will not dry fast enough without a little help. Hence the fan. I have already cast on MAPLE LEAF the Fifth. It is about 1/4 done. Now that I worked out the method I like best, I hope to knit through the remaining shawls I need to make as quickly as possible. I need enough time before Christmas to dye them all!